Niagara Gorge Railway – wrecked train, originally uploaded by Mic2006. The Niagara Gorge is rich in history. From the disasterous assault by American militia on Queenston Heights to the geological record in the Gorge’s rock there is no shortage of things to see and learn about. Of particular interest to me was the story of the short and disastrous life of the Niagara Gorge Railway. It runs along the bottom of the American side, just above the river. It is said that the construction was the most costly stretch of railway ever to be blasted. And not only was the line costly in money, but there was a heavy price in human life as well. See the documentary video on the Niagara Gorge Railway and the wrecked train that we found while hiking along the Niagara River. Amongst the more memorable disasters for the Niagara Gorge Railway were the sewage pipe explosion beneath the tracks, where passengers were showered in raw sewage, and there was also the huge landslide that killed 9 people. As mentioned in a coment about a recent accident in the gorge, NenaSan says, “The Gorge is a beautiful but unpredictable place that needs to be both feared and respected”. true enough, several helipads are marked out beside Devil’s Whirlpool for the recovery of injured hikers and the all to frequent bodies that are fished from the river. 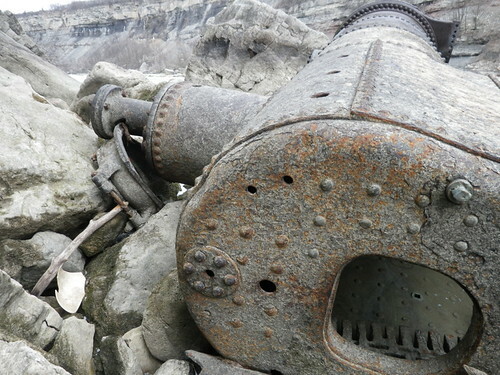 Pictured above is the boiler of an old train that we found while hiking in the Niagara Glen. It lies beside the Niagara River just across from the spot where the landslide wiped the Niagara Gorge Railway from existence – oddly, I suspect it might not have been the train that was used on that line. Buy "Caving in Ontario; Exploring Buried Karst"